We are Mark and Marie Buckfield and, having met through the sport of field archery, we were already making our own wooden arrows. Pestering Mark's brother, Lee (Master Saddler and Harness Maker), to make our leather equipment for us, led to Lee teaching us all the basic techniques we needed in order to make our own. Friends asked us to make archery equipment for them and we would take our trusty van round to the shoots with us, selling our arrows, quivers, belts and other items. We opened a shop in Honiton selling all these, also clocks, barometers and some of Lee's horse gear. The best-selling line was the belts. Some years ago Lee asked Mark to share a stand with him at the Royal Windsor Horse Show. That weekend we sold such a significant amount in belts that from that point we chose to specialise and haven’t looked back. Since then, and while still basing our work on classic English saddlery, we have spent many years modifying and refining our skills and techniques. Mark has won a National Award for Excellence of Craftsmanship from the Society of Master Saddlers and choosing to continue making entirely by hand (with not a die-cutting or sewing machine on either premises) we now believe that we offer a truly unique product and service. With so many options available there is much more to choosing a belt than first meets the eye... and we provide a full after care service too. 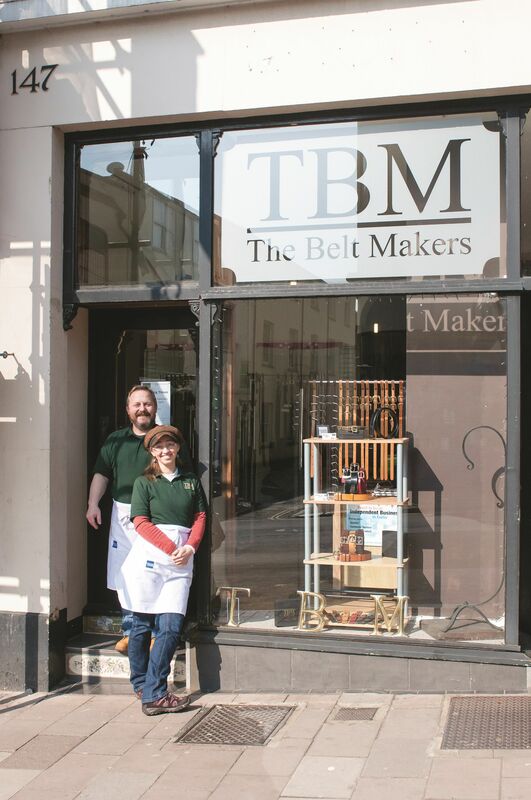 Our current retail shop can be found on Fore Street in Exeter's city centre and we also have a private workshop on Marsh Barton.